Posted on April 12, 2017 at 10:00 am. Western Australian MP’s are calling for national pokies revenue to be assessed as part of the annual GST distributions. The call comes after the State Government revealed the ‘grim’ status of WA’s budget, which is the worst it has been since the Great Depression. Western Australia is the only Australian state that doesn’t allow electronic poker machines to operate within its clubs and pubs, with pokies available only in Perth’s Crown Casino. This decision means WA notoriously collects a smaller amount of gambling revenue, paling in comparison to other Aussie states like New South Wales and Victoria where gambling taxes mean serious government revenue. In Australia, the Federal Government collects GST, assesses the information and then distributes the revenue amongst all states and territories accordingly through the Commonwealth Grants Commission. For years now, Western Australian MP’s have been lobbying for pokies revenue to be redistributed amongst all Australian states, in the same way that WA’s mining royalties are assessed. This would allow WA to benefit from gambling revenue, while having more funds available to provide community assistance to those impacted by problem gambling. If the move was approved, it would benefit Western Australia to the estimated tune of $400 million a year, but New South Wales and Victoria would feel the brunt. 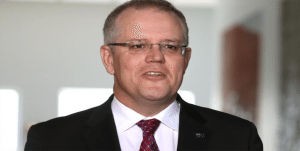 Scott Morrison, liberal MP and federal treasurer, has revealed he is examining the information and considering whether gambling taxes should form part of the annual GST distribution for the first time. Mr Morrison told Perth radio station 6PR that he has great sympathy for WA’s argument and that as a former social services minister, he knows all too well the impact the pokies have on the community. He said, “As my colleagues know, I have quite strong views about that particular social policy issue. I think Western Australia makes very good points in the national interest, not in a parochial interest. What is it [the GST formula] actually doing about social policy implications across the country? Mr Morrison’s comments came just a day after the WA Treasury revealed a concerning decline in the state’s finances, which is linked to a drop in projected GST revenue. On April 6, Premiere Mark McGowan said he was “losing sleep” over the state of the budget, saying it now the worst it has been since the Great Depression. This is a tough one, as the revenue earned from gambling taxes could seriously help WA out of the financial black it is currently in. It could be argued that Western Australia deserves a reward for keeping electronic poker machines and their widespread impacts away from the community. On the other hand, WA has made the decision to keep its clubs and pubs pokies-free, so benefitting from money generated in other states from these machines is certainly a conflict of moral interest.